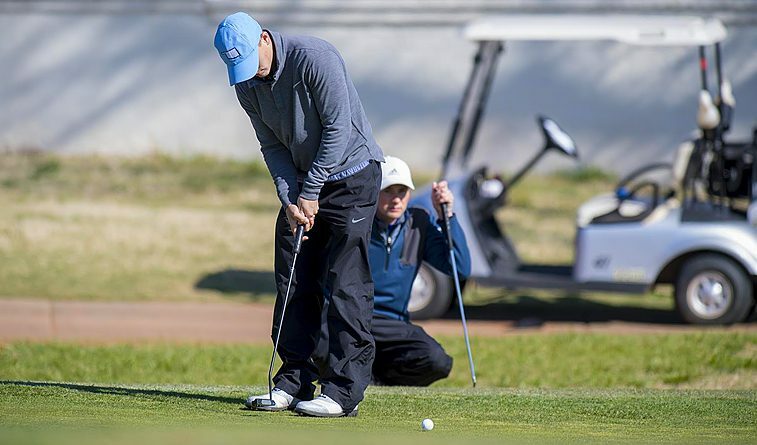 SPRING HILL, Kan. (ApriL 25) – Nick Pierce fired a 2-under-par 70 to lead Central Oklahoma on the final day of the Mid-America Intercollegiate Athletics Association Men’s Golf Championships here Tuesday. The Bronchos closed with a 294 and came in fifth after finishing three trips around the 7,081-yard, par-72 Sycamore Ridge Golf Course with an 887 total. Lindenwood won the 11-team tournament by 13 strokes over Central Missouri, followed by Nebraska-Kearney (883), Washburn (884) and UCO. Northeastern State finished eighth at 895. Pierce’s 70 was the second-best score of the day as he finished off three straight days of improvement, going from a first-day 79 to a second-round 73 before his closing two-under score. Alexander Hughes and Eli Armstrong both shot 74, while Holden Crago had a 76 and Wesley Jackson a 77. Pierce birdied the par-5 second hole and bogeyed the par-3 fourth before finishing the front nine with five straight pars to make the turn at even-par 36. The sophomore bogeyed No. 10, but birdied Nos. 11, 15 and 18 – all par-5s – to come in with a two-under 34. Armstrong was one-under through three holes before bogeying three of the next six in shooting an opening-nine 38. The senior got back to even-par with back-to-back birdies on the par-4 13th and par-3 14th, but bogeyed two of the last four holes for a closing 36. Armstrong had the best individual finish for the Bronchos, tying for 12th with a 220 total. Pierce ended up tied for 20th at 222. UCO now awaits word on selection for the NCAA Division II national tournament, though the Bronchos are expected to receive an at-large bid into the Central Regional. Northeastern State concluded its season with its second straight eighth place finish at the MIAA Men’s Golf Championship on Wednesday scoring a 895 (298-297-300). Local Tahlequah product Hunter Pennington wrapped up his junior season as Northeastern State’s highest individual finisher placing in a tie for sixth. Pennington carded a 2-under in the final round and wrapped up the championship with a 219 (77-72-70). Bryce Newton finished tied for 18th carding a 221 (70-76-75) and Casey Paul shot a 226 (74-73-79) which landed him tied for 28th place. Ty Shelnutt had NSU’s most consistent scores with a 77 on the first two days and a 76 in Wednesday’s final round; the Broken Arrow native was tied for 36th overall. Navid Majidi scored a 246 (85-76-85) and finished in 54th place. Lindenwood was the overall conference tournament champion with an 866.